The CK1010-5 bulb is designed for special applications where regular GOW and GOR type bulbs may not be suitable. This bulb allows a practical and most cost effective means of providing light in a multitude of different applications. It may be used alone as a light source or covered with any number of shades for a made-to-order ceiling fixture. This bulb is also a replacement for those included in the CK500 series of ceiling light kits. 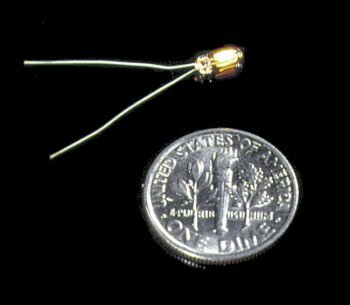 The bulb measures approximately 3/32" in diameter by 1/4" in length with 1" wire terminals. Current draw is between 40-50 ma when connected across a 12-volt power source. May also be used with the CK1010-16 and -17 series of candle bodies as a direct plug-in type bulb. 5,000 hour bulb life.